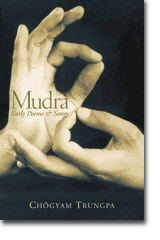 "Mudra Early Poems and Songs "
A mudra is a symbolic gesture or action that gives physical expression to an inner state. This book of poetry and songs of devotion, written by Chögyam Trungpa between 1959 and 1971, is spontaneous and celebratory. This volume also includes the ten traditional Zen oxherding pictures accompanied by a unique commentary that offers an unmistakably Tibetan flavor. Fans of this renowned teacher will enjoy the heartfelt devotional quality of this early work.